Sitting in the hills above Calheta beach in Madeira is Villa Petrel, a holiday home that blends the traditional with the modern to beautiful effect. Sitting in the hills above Calheta beach in Madeira is Villa Petrel, a holiday home that blends the traditional with the modern to beautiful effect. It boasts a spectacular position with panoramic views of both the sea and the surrounding countryside. The outside space truly makes the most of these views, with a terrace that wraps around the entire villa. Featuring both contemporary and antique pieces of furniture, there's a touch of luxury and elegance in every room. The colours and furnishings used are restful and natural, making Villa Petrel the perfect place for a relaxing stay. The ground-floor, open-plan living space is bright and airy, with numerous windows and glass sliding doors that flood the whole area with light. The doors also open directly onto the terrace with its wonderful views. In the lounge space is a sofa and armchairs, with focal points being the stunning fireplace and flat screen television. Adjacent to this is the games room with a pool table for working up an appetite before dinner. Meals are served in the dining room next door, at a stylish table that seats up to six people. The kitchen is well-equipped, which makes preparing and cooking meals a breeze. There's also a laundry for additional convenience. All four bedrooms are on to the first floor. The master bedroom features a double bed, dressing area, ensuite bathroom and clear sea views. Another bedroom has a double bed and enjoys both sea and hillside views. The two remaining bedrooms both feature two single beds each. Also on this floor is where you'll find the lovely family bathroom. The terrace that surrounds the villa is extensive and features several different areas. Wherever you decide to relax, socialise or dine, the sea views are breathtaking and you feel as if you're right above the water. Dotted around the terrace are charming seating and dining areas. The large, private infinity pool offers the very best views over the sea. It's surrounded by an area with sun loungers, which you can relax on as you watch boats sail by. There's also a covered barbecue area with built-in barbecue, outdoor kitchen and a dining table for enjoying al fresco meals. 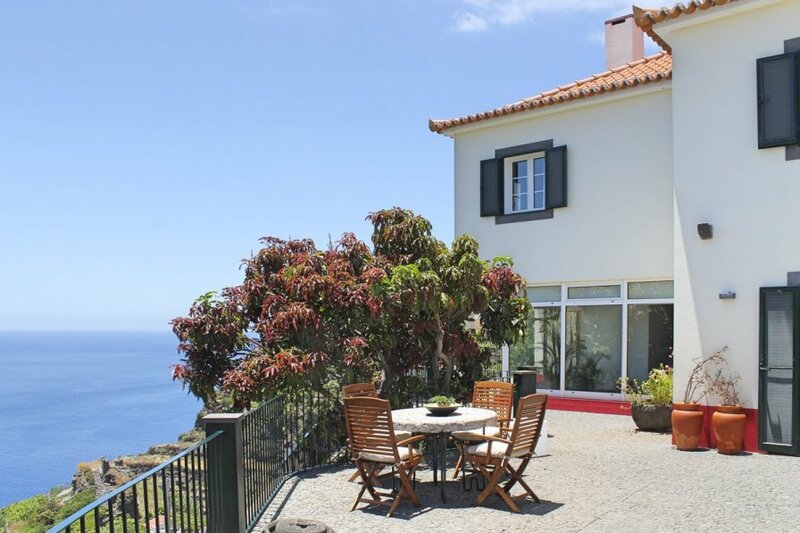 Villa Petrel is a 3-bedroom villa along the sloping hills of Calheta. The villa has a private swimming pool and a large veranda. Villa Petrel is ideally located for evening meals out in particular; with a restaurant just a few minutes' walk away. There's also another restaurant, a bakery and a couple of cafes within a 10-minute walk or five-minute drive. Head down to the waterfront and marina and Calheta and you'll find an even greater choice of places to enjoy drinks and meals. You can stroll right down to this area in around 30 minutes if you're feeling active! Reward yourself with a leisurely afternoon spent on the sandy beach. It's one of the few of its kind in Madeira, as the island's beaches are naturally volcanic. The sand was brought in from Morocco, with Calheta being the first town to get a golden, sandy stretch to enjoy. It's not just swimming that the sea is ideal for, you can also try a range of watersports. Popular activities include windsurfing, canoeing, waterskiing and scuba diving. Also close to the marina is the clifftop museum, Casa das Mudas, which showcases great Portuguese contemporary art. Another place that's well worth visiting is Engenho da Calheta, a working sugar cane factory. Here you can see how Maderia rum is made and even try a few drinks yourself. Another popular thing to do in Calheta is to hike through the lush hills, following trails to beautiful waterfalls and areas of stunning natural beauty. These trails and Levadas a few kilometres away and up the mountains and behind Calheta. Just a 40-minute drive away is the city of Funchal, Madeira's capital. Here you can ride the cable car up a mountain and stroll around beautiful botanical gardens. There's also an old town area that history lovers in particular will enjoy exploring.